Formerly an idol actor and now the father of two, Brunei-born Taiwanese actor Wu Chun (吳尊) recently spoke with Esquire about his experiences with fatherhood. For the majority of his career, Wu Chun had concealed that he was married to his childhood sweetheart, Lin Liying (林麗瑩). The truth came to light last year, which is when he also admitted that he and his wife had a daughter, known as Nei Nei, and were expecting a son. After this revelation, Wu Chun appeared to become more lax about exposing his personal life to the media. Earlier this year, he and Nei Nei participated in the reality show, Dad is Back <爸爸回來了>, where viewers witnessed the father-daughter pair interacting in a 48-hour period. On October 10, which happens to be both Wu Chun’s 35th birthday and Nei Nei’s fourth birthday, the two even attended a public anniversary celebration of The House of Dancing Water at a casino in Macau. 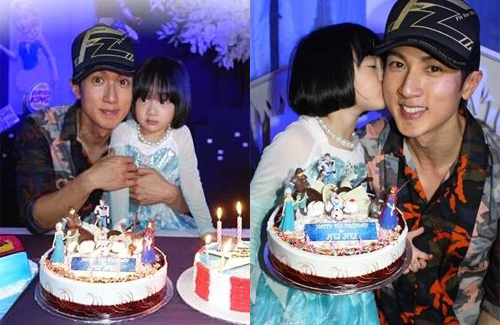 Raymonds cake should go to wu chun’s daughter. I know right , lol, seems more fitting. LoL… must say that cake is pretty lame. Come on man, you’re millionaire.. could do better. Even my daughter’s cake looks better and im no millionaire.